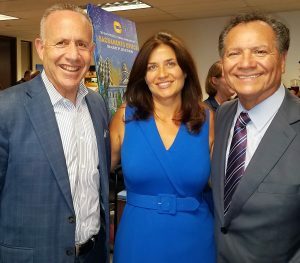 Mayor Darrell Steinberg, Cordoba Sr. VP Lucy Labruzzo and Cordoba President & CEO George L. Pla. 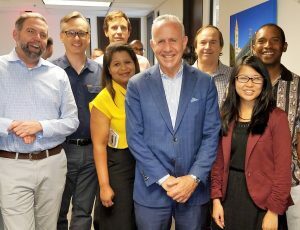 Cordoba Corporation celebrated the grand opening of its new office located at 770 L Street, Suite 1240, in Sacramento on August 2, 2018, with special guest Sacramento Mayor Darrell Steinberg. Mayor Steinberg was introduced by California Air Resources Board Member and former State Senator Dean Florez, who worked for Cordoba Corporation early in his career as an intern in Cordoba’s Los Angeles Office. Mayor Steinberg welcomed Cordoba Corporation to Sacramento at an exciting time in Sacramento’s history as it experiences a renaissance and continues its emergence as a technological leader and innovator. He saluted Cordoba Corporation President & CEO George L. Pla and noted how he associates “Integrity” and “Community” with Cordoba Corporation. The event was attended by Cordoba staff, California High-Speed Rail Project staff, clients and friends, who enjoyed locally catered appetizers and refreshments while exploring the new office. As part of the event program, Cordoba staff presented Cordoba’s Director of Operations for Transportation Gus Chung, who manages Cordoba’s Sacramento Regional Office, with an enlarged portrait of the grand opening invitation signed by Cordoba team members. 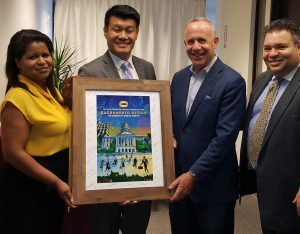 Cordoba’s Alex McCracken (Left) and Biagio Bucaro (Right) join Mayor Steinberg in presenting a signed copy of the event invitation to Cordoba’s Gus Chung. Cordoba’s new 6,500 square-foot Sacramento Regional Office is within walking distance of the State Capitol and is located in the same building as the California High-Speed Rail Authority and its Rail Delivery Partner Team, of which Cordoba is a team member. As a Rail Delivery Partner team member, Cordoba Corporation staff are responsible for utility relocations and interconnections, third-party agreements, environmental services, permitting, estimating, scheduling, procurement, contract administration, grant management, small business outreach, finance, accounting, and regional management/regional engineering services for the California High-Speed Rail Project. 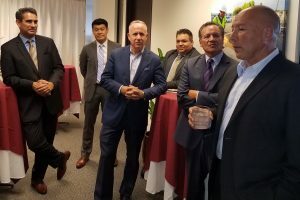 From Left to Right: Cordoba’s Executive VP/COO Randall Martinez, Gus Chung, Mayor Steinberg, Biagio Bucaro, George L. Pla and Senator Dean Florez. While serving to the support the California High-Speed Rail Project, the new office will also support Cordoba’s ongoing growth in the Sacramento and San Joaquin Delta area and represents a new chapter in Cordoba’s Northern California presence — a presence that we have enjoyed since 1988. Since that time, Cordoba Corporation has successfully serviced numerous clients located in the Sacramento region, as well as the City and County of San Francisco, Alameda County and Santa Clara County. They have included the Sacramento Regional Transit District, Sacramento Municipal Utilities District and the State Department of General Services, among others. Mayor Steinberg and Cordoba High-Speed Rail Staff. About Cordoba Corporation: Founded in 1983, Cordoba Corporation is statewide full-service engineering, construction management and program management firm specializing in the delivery of infrastructure projects in transportation, education, water and energy sectors. Cordoba Corporation has offices in Sacramento, San Francisco, Chatsworth, Los Angeles, Santa Ana and San Diego, and has been recognized by Engineering News-Record as a Top 50 Program Management Firm and a Top 100 Construction Management-for-Fee Firm in the nation, and a Top 100 Design Firm in California.